Success in the modern world depends more than ever on communication skills. The St. John’s Prep English Department helps students acquire the skills necessary for successful communication: reading, thinking, analyzing, and writing. Through literature, writing assignments, and class discussions, we introduce students to the important issues and ideas that will help them to explore their own identity and the nature of the world around them (course descriptions follow). Students entering the High School advance their communication skills through reading, thinking, analyzing, and writing. Each year features a signature focus. Ninth grade English begins with an overview of the study skills necessary for success at St. John’s Prep. Through exercises which involve reading and composition assignments, students learn note-taking, outlining, and organizational skills. The literary focus of the ninth grade exposes students to the study of the four major genres: novels, short stories, poetry, and drama. Tenth grade English is divided into a study of archetypes in literature and the study of tragedy. 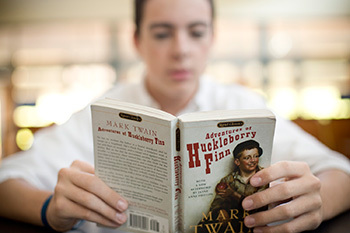 Eleventh grade English presents a comprehensive study of American literature, and twelfth grade centers on a wide-ranging study of British literature. The difficulty of course readings and writing assignments varies by level. For example, an Honors class may read five books per quarter, while an Accelerated class may read three, and a CP class two. Similarly, while all students will write often each quarter, the degree of difficulty in the assignments reflects the level of the class. This course includes the study of vocabulary, literature, grammar and writing. The study of literature aims at developing the desire to read the major genres: short story, novel, drama and poetry. This study stresses both content and interpretation, encouraging the student to think creatively. The writing component of the course starts with the basics of composing sentences and paragraphs and takes the student through the process of writing the five paragraph and longer essays. Grammar and vocabulary lessons are derived from the reading and composition sections of the course. While not as demanding as the Honors course, the Accelerated course is designed for the advanced student, stressing vocabulary, literature, grammar and writing. Formal literary terminology as well as analysis and personal interpretation will be presented as the student is introduced to quality works in the major genres: short story, novel, drama and poetry. Grammar and vocabulary lessons are derived from the reading component of the course. The Honors course challenges gifted students to develop their abilities to read and write in a variety of genres. Students read short stories, novels, plays and an epic poem. Focus is on understanding genre and taking notes on difficult reading. Students also learn how to write in a variety of genres: description, narration, exposition and persuasion. Great emphasis is placed on constructing paragraphs. Practical grammar and vocabulary study supplement the reading and writing and help prepare the students for standardized examinations. Prerequisites: English 1 College Prep and/or departmental approval. The goals of this course center on reinforcement of the writing process introduced in the freshman year through extensive use of the steps of brainstorming, drafting, revising, and editing in a variety of writing assignments. In addition, the course stresses paragraph development, multiparagraph essay writing, more sophisticated stylistics, and the study of vocabulary in context. The expository essay serves as a vehicle to write about the literature presented in the study of myth, tragedy, and comedy/satire. Prerequisites: English 1 Accelerated and/or departmental approval. The goals of this course have been formulated to challenge academically accelerated students. This course of study focuses on literature and composition. The students will be introduced to a number of new and more sophisticated concepts in the study of mythology and tragedy. Reading based vocabulary and grammar study supplement the composition work. The English 2 Honors course is a challenging and varied course of study that emphasizes literature and composition. The course seeks to make the students proficient in reading and analyzing myths, tragedies and comedies. Reading based vocabulary and grammar study complete the requirements for this course. Students will complete a lengthy literary research paper during the second semester. This course introduces the student to the themes and ideas prevalent in the development of American literature. The composition component of the course continues the development of the writing skills necessary for all college-bound students. Students will write a research paper. The SAT exercises include vocabulary in context study, critical reading skills and familiarity with the test format. Using either a chronological or a thematic approach, this course stresses the evolution of themes and styles in American literature, emphasizing a challenging reading curriculum. Conventional writing skills are developed: brainstorming, drafting, revising, editing and proofreading. Students will write a research paper. The SAT exercises include vocabulary in context study, critical reading skills and familiarity with the test format. Prerequisites: English 2 Honors and/or departmental approval. The English 3 Honors curriculum attends to the disciplines of literature, oral and written communication and SAT preparation. The literature program focuses on American literature where the student will explore themes of his multi-cultural American heritage. The composition curriculum stresses conventional writing techniques. Students are required to write one research paper. The SAT exercises stress vocabulary in context study, critical reading skills and familiarity with the test format. Academic development in the disciplines of English attends a collaborative interaction of four basic skills: listening, speaking, reading, and writing. The English 4 program stresses these skills in an introduction to five genres of British literature: poetry, the short story, the novel, drama, and the essay. The scope of the program traces British literature from its origins to the present. In addition, this program stresses the importance of writing by assigning composition topics which will help the student develop a knack for literary analysis. Students are required to complete at least one major research paper in order to pass this course. English 4 Accelerated focuses on a challenging curriculum of reading and analysis of works in British literature. Students will read from the four genres of short fiction, novel, drama and poetry from the Anglo-Saxon period to the present day. The composition component of the curriculum stresses the further development of the accelerated student's skills in exposition, narration, description and research. Students are required to complete at least one major research paper to pass this course. English 4 Honors is a course that features a comprehensive chronological and thematic study of British Literature. The course will start with the earliest examples of British Literature and will conclude with modern British Literature. Students will read selections from Beowulf, Chaucer's Canterbury Tales, Shakespeare's sonnets, tragedies and history plays, major British poets, novelists, and playwrights. The historical background which nurtured the various movements in British Literature will be discussed. Writing assignments will include a personal narrative, research papers, and several other essays on various topics. The course will continue to prepare students for college writing. What is rhetoric? The AP Language course seeks to answer that question by examining the crucial relationship between form and content in the pages of American literature, history, and culture. The principal objective of this course is for all students to become engaging writers for a variety of audiences and purposes. The course includes a comprehensive introduction to classical rhetoric, focusing on persona, audience, rhetorical appeals, and rhetorical schemes and tropes. During the course of the year students compose a variety of expository, narrative, and argumentative papers, focusing on rhetorical analysis in close reading essays. The Advanced Placement Writing Rubric is also used to assess numerous timed compositions. At the conclusion of the course, students are expected to sit for the AP English Language and Composition Exam. The Advanced Placement English program at St. John's is a sophisticated approach that is open to highly motivated students. It focuses on a class experience where the students are able to learn and to teach at the same time in an atmosphere of both lecture and discussion. It presupposes not only the highly motivated student, but also the student who has mastered the forms and skills of English usage and who is ready to attain mature and collegeoriented abilities in reading, writing, analysis, class discussion, critical technique and the integration of these skills with a love for the material and its application to human experience. The students study the chronological development of English literature in its various forms. Students may also participate in a series of seminars which specifically prepare them for the AP exam's style of questions. These seminars enhance the participants' awareness of what is required for success on the AP examination in May.